Maurice Sendak, ‘Where The Wild Things Are’ American writer and illustrator Maurice Sendak, who is best known for his classic children’s books including Where the Wild Things Are, has died at the age of 83. Over a career that began in the late 1940s he illustrated more than 100 books and wrote more than 20, but it was Where the Wild Things Are, published in 1963, that made his name internationally, selling over 17 million copies. 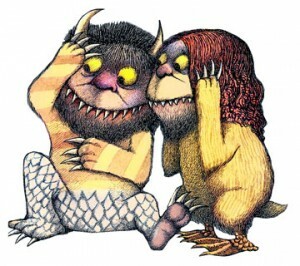 The wild things of Max’s imagination were based on Sendak’s own relatives. He was born in Brooklyn, New York, to Polish Jewish immigrant parents and was aware, in his early teens, of the death of much of his extended family in the Holocaust. Sendak’s 1970 picture book In the Night Kitchen caused controversy of a different kind, with its depiction of an entirely naked small boy running through a surreal kitchen where he is baking a cake on a dream journey. The book appears frequently on the “most challenged” or “banned” lists compiled by the American Library Association. endak’s own favourite among his work, Outside Over There, tackles sibling rivalry through the story of Ida, a young girl who resents her baby sister but must then save her when she is kidnapped by mysterious goblins. Sendak also said that the term “children’s illustrator” annoyed him, since it seems to belittle his talent. “I have to accept my role. I will never kill myself like Vincent Van Gogh. Nor will I paint beautiful water lilies like Monet. I can’t do that. I’m in the idiot role of being a kiddie book person,” he said. However, he was honoured by the children’s books world, winning some of its most prestigious prizes, from the Caldecott medal and the Hans Christian Andersen award to the Astrid Lindgren memorial award. Sendak lived with his partner, Eugene Glynn, a psychoanalyst, for 50 years until Glynn’s death in May 2007. Sendak described himself as “caved-in with sadness” at the loss but he continued to work, producing Bumble-Ardy, a book featuring a family of pigs last year. This entry was posted in Movies, News, Viral Video Of The Week and tagged Movies, News, RIP, Viral Video. Bookmark the permalink.